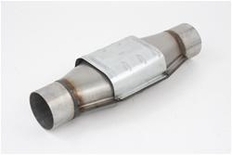 Most of us spend a lot of money on exhaust systems, only to leave the factory Catalytic Converter on the car, creating a bottleneck that robs you of the performance you desire. Pacesetter Hi Flow Catalytic Converters solve that problem. The part number for this item is 80-0028 and it has a 3" inlet and a 3" outlet. It is designed for vehicles with a 5.9L engine or smaller.